You know those treats that you want to only eat a bit of because you know they are so decadent, but you just can’t because they are THAT GOOD? Presenting our very own gluten free and vegan Cream Egg Brownies. Hamilton has a bit of a reputation for cream egg brownies. There’s a FANTASTIC bakery here called Cake and Loaf that mastered the most decadent cream egg brownie. 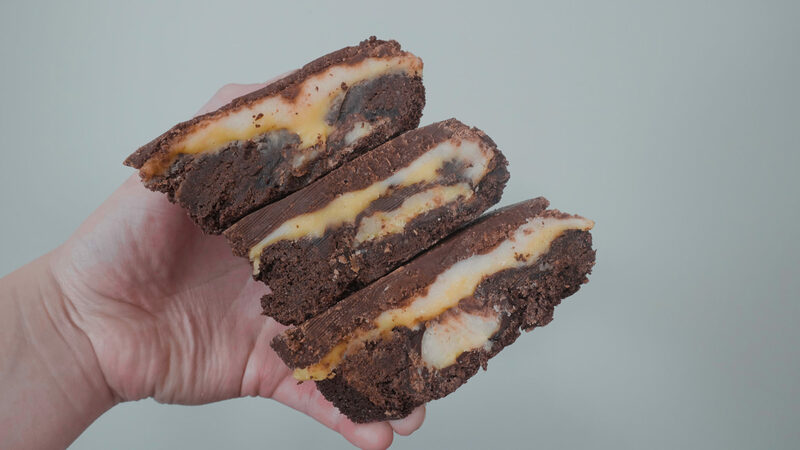 It’s a brownie stuffed with Cadbury Cream Eggs, topped with Callebaut chocolate based white, yellow and chocolate ganache… people in this city go nuts for them, if they can eat them of course. 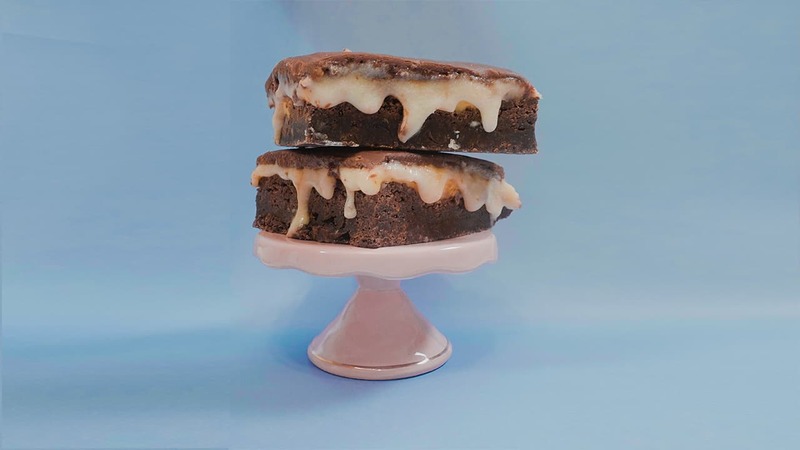 We decided to take it upon ourselves to make an inclusive version of these killer brownies that is also accessible for people to make: made for sharing with people who can’t eat gluten, dairy, eggs, and who are vegan. When building the recipe we considered making each layer out of chocolate (we make an awesome and super easy white chocolate that could have worked in the white and yellow layers of the ganache topping). Since we want our dessert recipes to be simple and with a high success rate, we decided to skip the cocoa-based ganache. 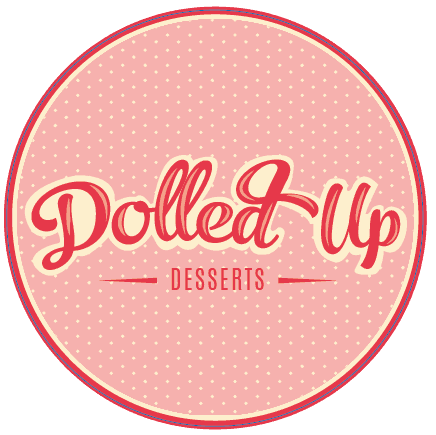 However, if you are interested in taking our topping to the next level, keep an eye out for our white chocolate ganache recipe in the near future! Personally, I am not a cream egg person. There’s just something about the goopy filling I can’t get over. I was and would still be Team Mini Egg if they were dairy free. If anyone has a dairy free/vegan mini egg recipe that is simple to make, PLEASE LET ME KNOW! There is a hole in my life that needs to be filled with all the colourful chocolatey mini eggs. After making this recipe, I decided that I do enjoy cream eggs- when they are in brownies. The creamy centre seeps out and caramelizes the brownie in parts making it super rich and deluxe! I was really happy with the result, even though it is a bit too sweet for my own tastes. The unique learning piece of this recipe is chocolate ganache. Our ganache recipe is super simple and versatile. Depending on the amount of sugar you add (you can add up to 2 cups!) you can even end up with a ganache icing that is perfect for cakes and cupcakes. We will be using this ganache recipe a lot so it’s worth noting now. These brownies do contain almonds, corn and soy (based in the non-dairy butter we use). You can make it soy free using a soy free non-dairy butter, and corn free if you use rice syrup rather than corn syrup in your ganache. Melt all the chocolate for the chocolate ganache. We will use some of it to make the cream eggs, and the rest to make ganache later. Using a silicone egg mold and a spoon, spread a thin layer chocolate around hole in the mold. Place mold in the freezer for 15 minutes. If you do not want to use an egg mold, you can make your eggs like peanut butter cups. To learn how to make peanut butter cups, check our recipe! While the shells are freezing, make your cream egg ganache. Melt non-dairy butter and mix in the corn syrup. Gradually add icing sugar to ganache until it reaches a consistency that you like. I prefer it to be a consistency I can grab and mold with my hands, which will come in handy later. Split the egg ganache between two bowls. Add a small amount of food colouring to one of the ganache bowls and mix until it is the desired colour. Remove egg mold from freezer. Fill each mold with white ganache and a small amount of yellow ganache to make an egg. Cover to top of each mold with chocolate to seal the cream egg. Freeze for 15 minutes. While the eggs are freezing, prepare the brownies as directed on the baking mix package. Once the brownie batter is prepared, remove eggs from their mold and place them into the batter. Bake the brownies for 30 minutes. Let cool completely. While baking, prepare the chocolate ganache. Heat up the non-dairy milk in the microwave or on the stove until warm. Add the chocolate chips and butter and let melt while stirring. Gradually add icing sugar to the ganache and stir until it is thickened. Set aside. To finish off the brownies, layer on the remaining cream egg filling by spreading on each coloured ganache using a spatula (or your hands, if that suits you). Start with the yellow, then the white and then pour and spread the chocolate ganache on the top. Place brownies in the fridge or freezer to set and solidify for at least a half hour. Once solidified, cut and serve. You can keep these brownies at ambient temperature for up to 2 days in an airtight container, or freeze them for up to 6 weeks. Do not refrigerate them once cut- it will dry them out!